I’m a huge fan of the Bourne movies (who isn’t? ), and when I learned about Matt Damon’s efforts to help bring clean water to everyone who needs it, I immediately wanted to help out. Finding Water.org was a wonderful coincidence because I have been looking for the effort Nadimi.com could sink its teeth into that would at same time have mass appeal. When you think about it, aside from air there is nothing more basic to our survival than H2O, and we are all obsessed with clean and clear water. See – Bottled water crazed society. Watching Matt Damon’s interview was heartbreaking – the look on his face and the difficulty with which he describes the memories of the awful conditions in those countries really makes you experience the horrors that he saw. 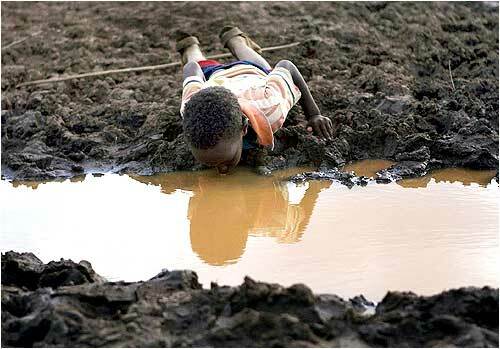 Imagine kids drinking dirty water that they scoop out of a shallow whole in the ground. Sad! Disgusting! Completely unnecessary! Fortunately, also repairable! In the “Just Screw It” spirit that helps so many of us get off our big round glutes and get things done, I decided to give myself a birthday present: a brand spanking new (for Nadimi.com) charity campaign to help Water.org raise money. True to myself, I started pestering all my friends and anyone I could come in contact with to join. I’m asking for $25 to provide someone clean drinking water FOR LIFE. Just imagine – what we regularly spend on two movie tickets and a bloated tub of popcorn with questionable “butter” can give someone fresh water forever. This simple bite-sized gift will make a huge difference, and can be paid via credit card or Paypal in 2 seconds. Do yourself a favor and get that positive karma coming your way with one magic click here donating right now.